Several years ago, Dr. Ann Smart Martin and I met at a conference and discovered our mutual interest in making eighteen and nineteenth-century documents accessible through material culture. Her book, "Buying into the World of Goods: Early Consumers in Backcountry Virginia", had already informed my work on the eighteenth-century ledgers located in the National Museum of American History Archives, some of which we hoped to exhibit and interpret in the American Enterprise exhibition, which opens July 1, 2015. The ledgers of merchant William Ramsay detail the mercantile activity in the town of Alexandria, Virginia, from 1753 to 1756. After a recent conservation process, they became available for study. However, the real meaning of these ledgers could only be unlocked with a thorough investigation of their nine hundred pages of content. Dr. Martin agreed to undertake this work with her students through a semester-long class on material culture and museum work at the University of Wisconsin-Madison. Read on to find out from Dr. Martin what she and her students discovered. How can you make a historic ledger speak ... and then make it interesting to all? At first glance, an eighteenth-century ledger looks like a dusty old book filled with odd words, names, and numbers—impenetrable. In the spring of 2013, a class at the University of Wisconsin-Madison took on the challenge of decoding the ledger. We assembled a team of sixteen students from across campus (twelve undergraduate and four graduate), all of them interested in museum careers. We had thirteen weeks to work. 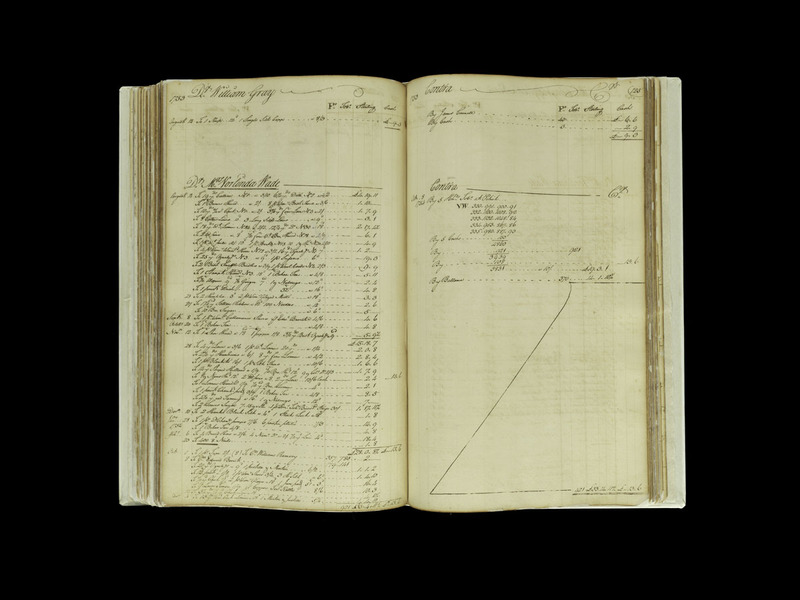 William Ramsay, a prominent Scottish tobacco merchant in Alexandria, Virginia, kept a ledger book from 1753 to 1756 to track purchases and payments for his business of purchasing tobacco and selling consumer goods. He offered credit to trustworthy customers so they could purchase supplies and pay at a later date, usually when a cash crop came in. Established in 1749 at an official tobacco inspection site on the Potomac River, Alexandria boomed as a port town, attracting craftsmen, businesses, and taverns. We wanted to use the ledger to discover what kinds of objects were bought at Ramsay's store. At the start of the semester, I remember one of the students exclaiming, "It's like a code!" Part of the ledger's code is simple double entry accounting that notes a list of economic transactions by day and by name. The left page of the book (marked "debtor") recorded the date, customer's name, what was purchased, and for how much. The right side listed when and how a person paid. The payments were recorded in British money, e.g. pounds, shillings, or pence. Twenty shillings equaled a pound and 12 pence equaled a shilling. (Compare that to our own dollar system, which is divided into 100, not 240.) In the first few weeks of the course, we created a database and started entering William Ramsay's business transactions—debts and credits. Since the original ledger book was at the Smithsonian, we had to rely on some note cards and a microfilmed copy. With 407 pages of accounts, each student had to quickly become an expert in eighteenth-century global trade. To start, we needed to learn to read the spidery handwriting of names and purchases in the ledger, many of which seemed illegible. Next, even if we could read the entry, the words sometimes made no sense. An array of consumer goods in the ledger had lost any meaning in modern English. "What’s a 'baddledor'?" we wondered. What about "yards of thunder and lightning"? Or a "twig whip"? Researching the goods for sale was both the most challenging and the most fun part of the project. We learned, for instance, that a baddledor was a racket to play ball, illustrated in the hands of children in a few family portraits. Thunder and lightening fabric was tightly woven wool that could repel water. Unfortunately, we never found a good description of a twig whip. What did we find? Alexandria was growing fast, so lots of tools, nails, and hardware flowed through the store—even a marble chimneypiece. Women shopping there purchased fine fashion: silks shoes, handkerchiefs, whalebone petticoats, and jewelry. Men needed wigs. But not all customers were wealthy nor all purchases fashionable. William McCarty's slave Harry, for one, bought a linen handkerchief and other items, paying for them with crops he grew. Our database completed, we crafted a list of thirty possible objects from the ledger, hoping that we could find representative examples of these objects in the Smithsonian's collection. 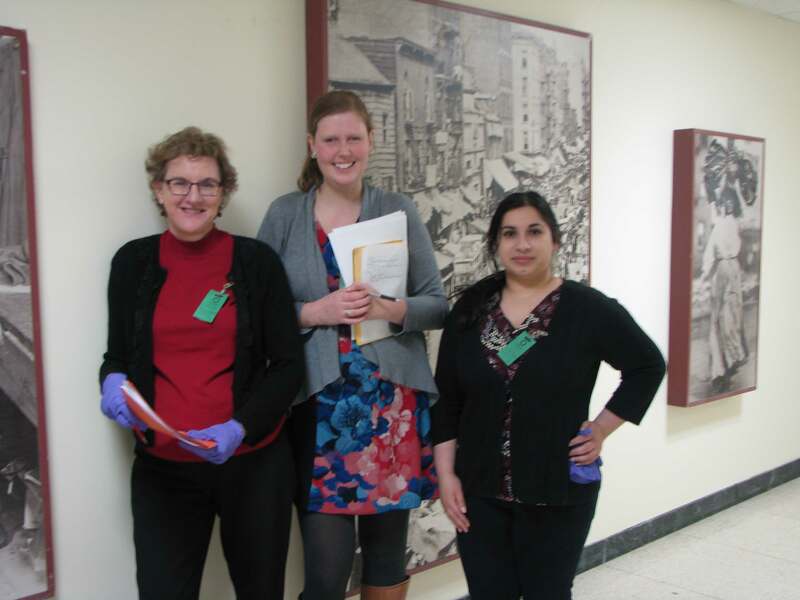 Three of us flew to Washington, D.C., to work with the curator Nancy Davis to look for those items in the Smithsonian's collections. What a crazy few days that was! We opened drawers and peered in cabinets, eventually examining almost sixty pieces in the hopes of matching purchases in Ramsay's account book. 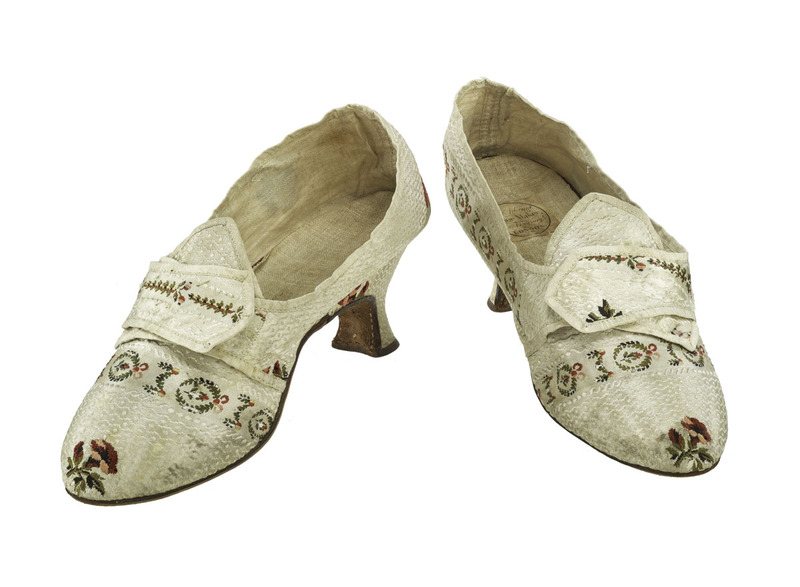 Finally, five objects—a mug, pair of shoes, book, ribbon, and handkerchief—were chosen that will appear in the American Enterprise exhibition. 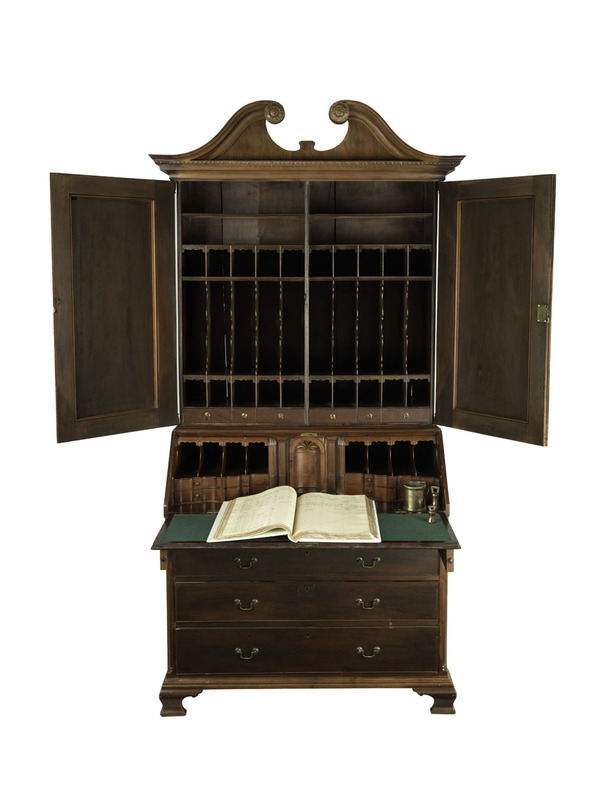 When it opens in July 2015, the Merchant Era section of the exhibition will provide visitors with a view of these objects, as well as Ramsay's desk, his ledger, and the bookcase on which it was kept. An interactive program will give visitors a chance to investigate Ramsay's ledger for themselves, exploring some of the people and objects that passed through his Alexandria store. This kind of deep historical research "decodes" Mr. Ramsay's business and allows the people and objects to speak. Take a sneak peek at the Merchant Ledger interactive, part of the "American Enterprise" exhibition opening July 1st, 2015. An interactive display will let visitors explore William Ramsay's ledger for themselves, learning more about the objects and people who passed through his store in Alexandria, Virginia. Special thanks goes to all the students who made this project possible: Elizabeth Ann Amherdt, Stephanie Ann Goodwin, Lauren Gottlieb-Miller, Madeline Gray Hagerman Elizabeth Jarvis, Nicole D. Kauper, Anna S. Lee, Anneliese McGavin, Sona E. Pastel-Daneshgar, Shagun Raina, Guus Sanders, Abigail Lynn Springman, Courtney Thrall, Monica Ann Welke, Rose Yahnke, and Danielle Morgan Zwang. Dr. Ann Smart Martin is the Stanley and Polly Stone (Chipstone) Professor in the Art History Department and the Director of the Material Culture Program at the University of Wisconsin-Madison.